The Hunt wheels are great but I needed a dynamo hub based front wheel so I ordered a complete new wheel set. lifetime guarantee policy so I’m not bringing any spare parts. The handmade wheels are built with: Pacenti SL25 rims, a mix of 32 Sapim Race & D-light spokes with a DT Swiss 240S back hub. The front hub: a SON28 CL Disc dynamo hub. This generates enough power to charge my Garmin GPS unit and phones via the USB outlet of my front light as long as I ride faster than 15 km/h. That does mean no charging during the big climbs since I’ll be climbing at speeds between 6-12 km /h looking to the height profiles. Tyres: I tried tubeless tyres but they’re just to tight causing nervous break downs during mounting and I don’t want to risk getting a serious issue with one of the tyres and not be able to get it back on the rim while being exhausted and having no power in my arms and hands. Fast and proven quality for my tyre choice: 28mm Continental Grand Prix 4000 S II Race tyres will get me across Europe as they have brought millions of others to their destination too. Probably the most sold tyre in the past three years. I used to ride 23mm width tyres, but 28mm gives me much more control and comfort with a loaded bike as I experienced after buying the Mason Resolution. I’ll use a 950, 750 and 550 milliliter Elite bidon and Paron Carbon bottle cages. Syntace C3 Aerobars: first of all I bought them to create a riding position without any pressure on my hands. Secondary improvement is the fact it makes me riding 3-4km / hour faster with the same effort. I’ve tried Shimano MTB pedals but they performed bad, so bought a new pair of Look Keo pedals as I’ve been using on my other bikes. For gearing I’ll change my casette to a 11-32 so I have 32-34 available for all the >12% climbs. Since I’m not a talented climber at all I was struggling getting to the top on a 28 during my last week in the mountains. And last but not least the most unuseful upgrade (but good for the moral): a Black / Red KMC X11SL chain. It works great but it is mainly because of the looks! For lighting and USB power outlet I use the Busch & Müller’s Lumotect IQ2 USB. It has a great reputation besides some issues with USB connector defects due to water corrosion but I’ll make sure I don’t get any water near the connectors. 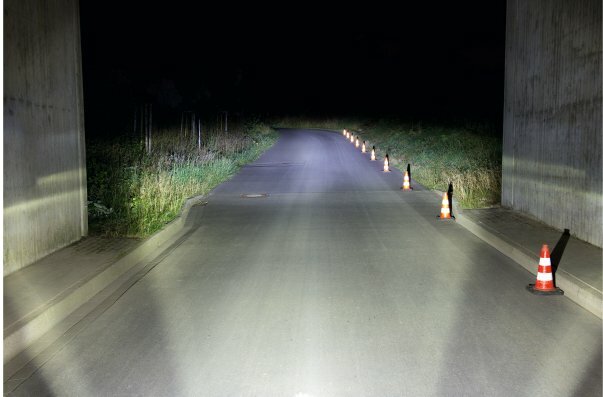 As you can see in the below image, the light is performing really well. During test rides last weekend I had numerous cars signing to me to turn of my main light and I wasn’t even in the 100% mode. GPS unit: Garmin Edge 810 – Had no problems with it until last week but I’ll just deal with it and if it crashes, I’ll have a backup. Powerbanks: two 10400mAh powerbanks which is enough for 2/3 days without any electricity in case my dynamo breaks down. To attach the headlight to my aerobars, I’ve combined a Profile Design UCM Universal Computer Mount with a Minoura SGS-400 Light Holder on which the Busch + Müller Handlebar Mounting Bracket is attached. 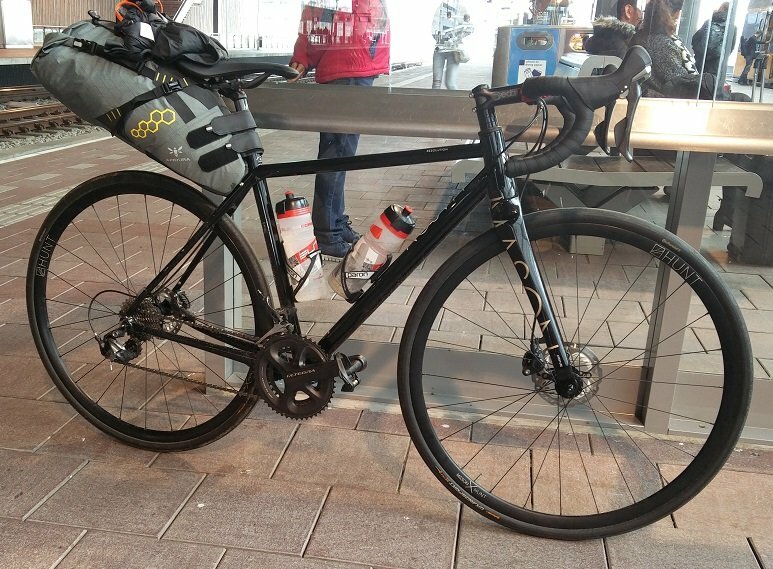 During the race itself, the front Apidura handlebar bag will support this construction but this should be enough for riding without the front bag. Morvelo base layer shirts: just does the job. Dries quick once wet. Pearl Izumi cycling shorts, 3D chamois has never caused any issues and has been my all time favorite. To bad I crashed with it two weeks ago, hopefully I get enough hours to make the new one as comfortable as the old one. Castelli Unavolta wool as third layer when cold. Still not sure about taking an additional jacket for extra warmth. I’ve been riding in 6 degrees celsius with short sleeves and normal shorts, in the rain and still not getting anywhere cold. Maybe do some +24 hour ride testing during some cold nights. PEARL iZUMi Thermal Lite gloves – I’ve done a couple descents in cold weather a few weeks ago and could keep my self warm enough without any gloves so this will do in the situations where I have low energy levels. Grib Grab Aero Waterproof shoe covers: extra speed and dry feet! Shoes: my three year old Sidi Genuis shoes. Tried new shoes, tried MTB version because those shoes are more easy to walk on but all perform worse than my good old road Sidi’s so going for the save option. Sleeping mat: Thermarest Neoair XLite – weighing just 350 grams makes it a perfect bikepacking matress. Previous racers didn’t bother taking an air matress but it is not only for comfort reason: it is an great insulator meaning I can also sleep on a concrete floor without the floor extracting all my body heat. 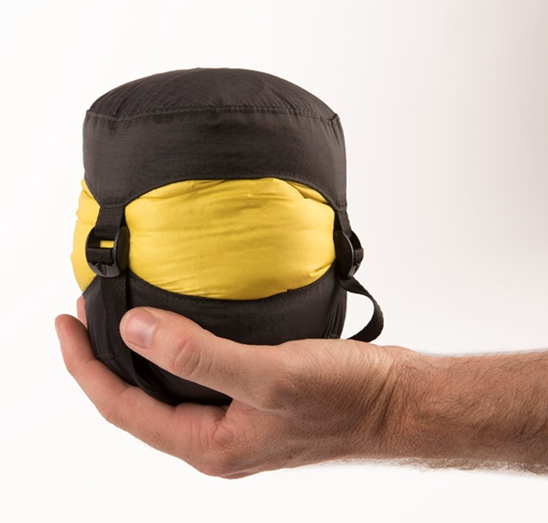 Pillow: I’m a difficult sleeper in terms of requiring enough neck support so I’ll take an Exped Air-Pillow UL. Only weighs 45 grams and packs at the size of a small wallet. My luxury item for the trip! Bivy bag: since I’m not going to take a complete tent with me, I’ll use a waterproof Alpkit Hunka bivy bag to ensure I keep dry at night and can basically sleep everywhere. Two spare inner tubes from Continental, nothing special but have used them since I started cycling so why change a winning team. Chain lube. A good performing drivetrain is crucial for fast riding. I’ll lube my chain every day, possibly saving me a few hours. Taking all these items make sense, right? An Heat Reflective Emergency Blanket in case I get cold (would be the first time in 28 years). It’s small, weighs 32 grams and gives me the feeling I’m well prepared for a race that is probably the craziest thing I’ll ever do in life. Science in Sports Go Hydro tablets to get enough salts & electrolytes. Sweating is my biggest enemy: during sunny hours it get’s me dehydrated, during night hours and mountain descents it gets me cold so it is crucial to have a regulated fluid balance. Passport, Insurance card & papers, Visa debitcard, AMEX & Visa creditcard, Euro’s, Franc’s, Kuna’s, Donar’s, Lev’s, Lira’s & my Turkish Visa. I’ve collected quite some foreign currencies during the past years so I’ll probably have some notes of each currency available. Sea to Summit pocket hand / cloth washing soap so I can clean my clothes every stop I have water available. I sweat a lot so need to make sure I get rid of all the salts building up in my shorts at least every day before it rubs my skins off. It contain 50 leaves of pure, dry soap so there’s no risk of leakage while compressing it in my bags. ABUS Special Lock Combiloop 205 – There will be a few moments I’ll have to leave my bike to do some quick shopping, so a small lightweight lock should prevent someone running away with a wheel or two. If you track down my position via GPS tracker while I’m sleeping to steal my beautiful Mason, I’ll hunt you down! This all will be packed into three Apidura bags. Apidura has been the preferred brand for many ultra cyclists since a couple of years and they have proven to perform well over longer periods of time. A regular saddle bag (17 liter capacity) which will be filled for 70%, one front hanging compact handlebar bag of 9 liter and a extended top tube pack for my electronics and some food storage. Not sure yet, but I’ll probably add two food pouches too, so I have plenty of room to store extra food and water. To be sure everything stays dry I have a set of 4 to 13 liter Alpkit Drybags to put all my gear in. Am I missing something or do you wonder why I am not taking certain objects? Let me know in the comments! 1 or 2 little something for diarrheas and stomach troubles. A little something for eyes too. Have a good journey, I’m following your dot! Thanks for the suggestion. All have been considered: never had serious problems with my stomach and can usually eat whatever I want. Since I have never tested any medicine for that, I can just buy it whenever I’m in need of it since there is no preferred ingredients. Ibuprofen is for pain relieving. If in pain, just deal with it. I’ll probably need to break a bone or torn a ligament so there is a real reason. Next to that, pain relievers have side effects like nausea and dizziness. Not something you want while riding your bike. About the headlight: I’ll use one of my phone ands the Luxos headlight has a 5 minute backup so when I stop riding it keeps shining. Like you conclude: I’m comfortable and happy with the current list so that is probably most important. Anything additional that I need, will be taken care of on my way to Turkey! Great write up!! I haven’t any experience of ultra cycling but going by your equipment list I would add in baby wipes. They can make you feel refreshed in an instant especially when water is scarce. But most importantly(to me) they are great for removing grease and oil when you’re maintaining your chain. Lube is a great thing for our wet climate but in a dry, dusty climate you run the risk of picking up sand and dirt in the chain lube. This will increase wear and could lead to bigger problems. A dry chain can be a clean chain too. Chain breaker is in the multi tool, same as spoke key 🙂 I’ve decided not to take a complete spare tyre. Will check my tyres before leaving Italy since there are numerous good bicycle shops so I can buy a new one if needed. If I have a serious gap in my outer tyre, I can use the Parktool Emergency Tire Boots. Everyone should take lube. It could literally save you 5 hours by having a clean running drivetrain. My best advice is take good waterproof /over kit, but take mid layers you are happy to chuck – that’s the warm heavy kit. I took a 10 year long sleeve cycle jersey and long fingered gloves / knackered Overshoes and ditched these when it got warm. Thanks for the suggestions Rob, appreciated to get feedback from a TCR veteran! Regarding chamois: never had any saddle sores during long rides and when I will get them, it won’t help any more so I have the skin repair creme with me. The trick for me is keeping my shorts clean, wash the salt out as often as possible. In that case, rain is better for me 🙂 Hopefully you find back the fun in riding and be back at the starting line in 2017! Who built up your wheels ? Loving reading this and really useful for me. Currently looking for a dyanmo hub with a light and usb charging available. Could you power both front light and the USB at the same time or would it not work at lower speeds? My SON hub is able to do both at the same time but I have read from other that some flickering can occur. I had no problems to do both most of the time. With climbing of course not. So you could only power one of the functions when climbing? 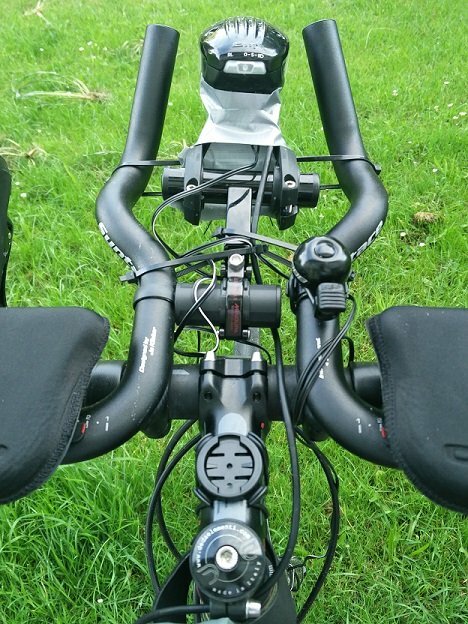 Hi Jan, what normally goes into your handlebar bag for your trips? Stuff I need easy access to like medicine, sunscreen, food, tire pump etcetera. hi Jan-Willem , Handgespaakt , they also took care of your lights setup ? 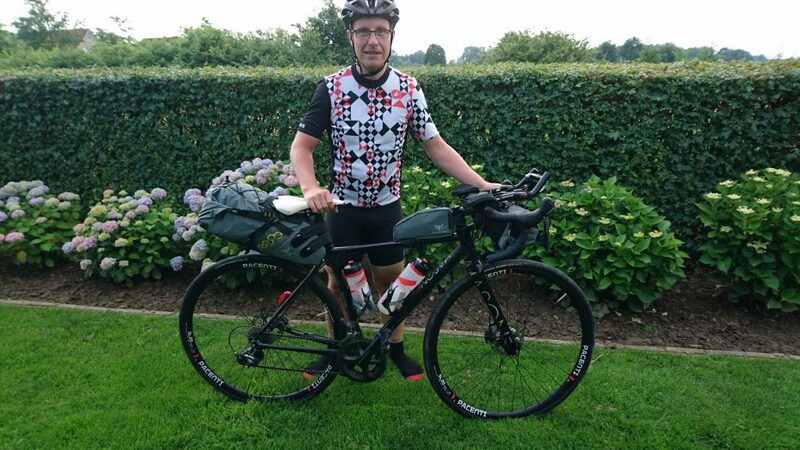 Previous Previous post: Paris Roubaix Challenge – And back to the Netherlands!